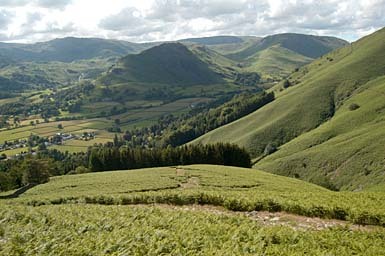 On the horizon, from the left, are the Northern slopes of Thunnacar Knott; Sergeant Man; High Raise; Greenup Edge beyond Helm Crag; Ullscarf and Steel Fell. Down the hill, in the foreground, are the conifers of the Forestside Plantation. The waterfall to the left of Helm Crag is Sourmilk Gill. Larger version of this picture.